“Goat milk is packed with medicinal properties that can cure severe health ailments like fractures, jaundice, paralysis, dengue etc. These days with life at risk to numerous diseases even from young age and non-availability of genuine goat milk we identified the business opportunity to sell goat milk and its value added products in cities. 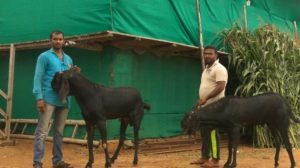 Besides, we friends wanted to do something together in the rural sector as we hail from a village in Mandya district, Karnataka,” says Mr. Krishna, Director, Vistara Farms. We four childhood friends wanted to something together in the rural sector. Goats are intrinsic part of village life and our preferred animals hence with overflowing enthusiasm and no experience we started the goat farm. Beetal breed was selected because it is the milking goat. Secondly male goat weighs 100-120 kg so is gainful when sold for meat while female goat weighs 60 kg so easy to manage. We bought the land blindly and no ground work was done on goat rearing when we started the farm thus paid a huge price for the same! In the first year of establishment itself we faced 70% mortality. All four of us sat together and brain stormed to identify the mistakes. Inappropriate location and protein rich diet were the major errors. We restructured the feeding schedule, made changes in the shed to make it compatible as per goats’ characteristics and took preventive measures on its health care. The following year mortality reduced to 0.2%. It boosted our morale irrespective of the fact that profits expected turned into opportunity loss! In year 2014-15 farm operations and animals stabilized then we took the next step to begin processing of raw goat milk into value added products. We knew to be successful in the business of goat milk value addition our strength would lie in product quality therefore we hired professional cheese maker Mr. Aditya Raghavan. He tuned up all products very well. Next in order to sell commercially we required investment that is when I brought in my friends who understood the idea. Finally 20 of us joined hands and incorporated a private limited company in 2016. We all came from different professional background. Diversity is our strength as I get the right information from the right sourced as required for the business from these 20 people be it design, packaging, machinery, retail statistics and so on. During any hurdle, one or the other idea pops up to resolve the issue and the farm operations gets streamlined. Our first farm is located at Kunthur, 150 km from Bengaluru while newly started second farm is in Malavalli, 100 km from Bengaluru. The processing unit is in Nagadevanahalli near Kengeri, Bengaluru. Goats are milked manually once in the morning. The milk is brought to the processing unit in the chiller in 3.5 hours drive from the farm through vans. The shelf life of raw goat milk is upto 12 hours if stored properly. Raw milk is then processed into pasteurized milk, yogurt and cheese. All our goat milk value added products are without any preservatives. Yogurt stays good to eat for 15 days. We prepare 4 varieties of flavoured yogurt namely custard apple, honey-banana, chikoo and tender coconut. We have consciously selected local flavours as consumers can relate to it and fresh pulp is easily available for all four fruits. 10 litres milk is processed to make 1 kg cheese. It takes three days to make ready to eat cheese however aging can be extended upto 5 nights. As the cheese is aged the price increases but we are selling mostly fresh cheese. We make two variants of cheese namely Feta and Chevre, having shelf life of 60 days and 45 days respectively. Feta is plain while Chevre is flavoured in 3 varieties – plain, garlic and pepper. Packaging and labeling of all three products is done in-house. It is quite attractive. In the retail sector we have started lean with products on shelves at only two Indian stores, Namdhari and Godrej Nature basket. None of our products have local competition. Pasteurized milk and yoghurt are trend setting products, already in distribution and have no-competition at all but at the same time have less consumer awareness unlike goat cheese. Pasteurized milk is sold at Rs. 300/litre thus it becomes a premium product when compared to cow milk! However, with best product quality we believe demand will be increased for milk and yoghurt very soon. At the moment our focus is on cheese. 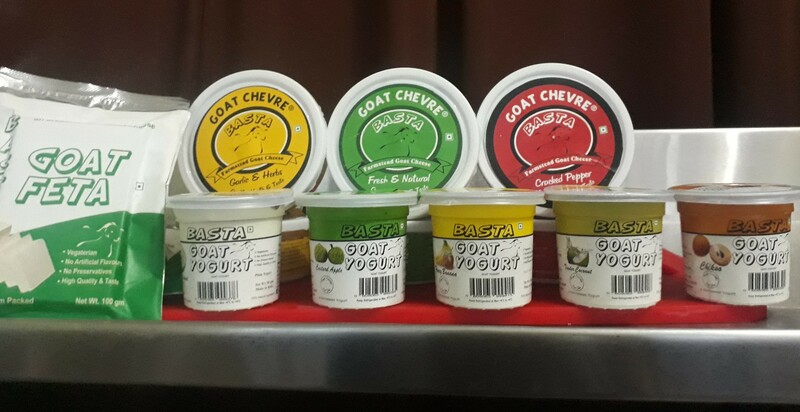 In goat cheese variants we compete with imported products that are produced and marketed by companies in the business since 1800! Definitely our goat cheese gets an edge over our rival products as ours is fresh organic goat cheese without any preservatives while imported goat cheese has preservative for obvious reasons yet we are fighting the price war with these imported products! Recently we have ventured into B2B segment with cheese sales. 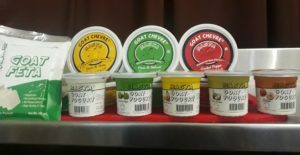 We aim to sell Basta cheese to premium hotels and restaurants as goat cheese is more preferred in International cuisine. Although we have not 100% capitalized the market and presently we are in 10-30% loss (that is huge) yet we have taken the loan of Rs. 2 Crore from Karnataka bank for expansion. We were lucky to interact with an excellent manager who trusted our potential and products. We need more such people in agricultural banks also unlike the present managers who maintain a tag line of ‘come after 15 days’. In expansion, we aim for 1000 litre/day milk production with increase in herd size to 3000 goats from present 50 litre/day milk production from 200 goats. We hope as the production scales up the cost will be reduced and we shall be able to earn better returns. The experiment to develop on new variants for existing product line shall continue. Our nation and youth have the potential to boost the economy with agriculture revenues but what is required is support from the Government, financial institutions and experts. Innovations must be encouraged and first time entrepreneurs should be provided with all possible assistance then India will certainly become world leader! Mr. Krishna holds post graduation in business management and has CWA degree. 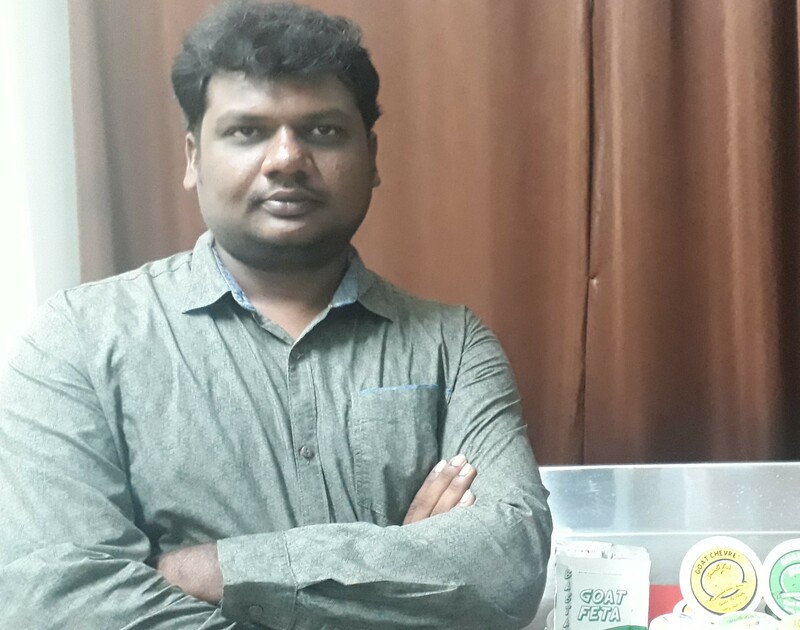 Managing the balance between job in IT industry and business for four years, he finally bid adieu to job and became full time agripreneur in December 2017.